NEWS UPDATE – FT3YL is QRT. François is reaching the end of his stay in Adelie Land and will return to France soon. Operating from Adelie Land was really a very hard challenge. He did not have much free time between his job, high winds, rig’s breakdown and solar blackout, to be on the air. He made 1200 QSO with JA / VK / ZL, some US stations and very few EU stations. Remember, François is a newbie and his first HF QSO were from Antarctica! AUGUST 12 – François informed this week he has only 5 watts output power with his IC706. After checking a possible error, we told him that there must be a big problem with his IC706. Bad news !! Oufffff ! He also brought with him a 2nd transceiver; an old FT890. We told François to use the FT890 and he will try to repear the IC706 later. We don’t know if it’s suddenly better propagation or just the new transceiver, but he has made for the first time a SSB pilup! He is so happy to hear clearly stations from Asia, USA, Russia and few french stations. Remember, François is a newbie, but he has made 140QSO in 3 days. He is so happy. He will try to be more active on the air. For the moment, he can only work in SSB with the FT890 but he will configure it quickly to digital modes: JT65 and FT8. Sometimes, he has to QRT suddenly due to very high winds who goes from 0 to 130-140 km/h in 2 minutes. It is katabatic wind. This wind comes from the land and is plenty of snow. It’s like sandstorm, but it is snow. In 2 minutes, he has to disconnect antenna due to big static electricity and to go back to the station with visibilty less than 20 meters. You can see the wall of snow on pictures below. This week, the weather station recorded gust at 210 km/h !!!!! Radio from Adelie Land is very, very, very difficult and more difficult if you’re a newbie. Adelie Land is not the coldest Antarctic base, but it is one of the most windy. Often, gusts are around 170 to 190 km/h. To install an antenna able to resist (or to survive…) to this high winds is not easy. Other Antarctic base are less windy; it is easier to install good antennas. 3 months after his arrival, François had a little free time to install his station. A GPA30 antenna was on his desk’s office. He started to make QSO in JT65 mode on 20m with JA, VK, ZL, W7, FK, UA0, UA3 and few Europeans. But some days later, François told us he had a big QRM due to electronic equipment in his building, he had to move all his station to another building (without heater inside). In Europe, it will take few hours to do it, but when you are in Adelie Land, it’s more difficult and his job is the priority number one. After moving his station, he found ROS problems on his antenna and few days later, very high winds about 195 km/h destroyed the antenna. Fortunately, F5NB and F5BU who had been in Adelie Land some years ago, had told François to bring two antennas. François will try to operate in PSK31 and may be SSB if propagation goes better. QSL for FT3YL had been printed by Gennady UX5UO, we thank him hugely for the big help. Also, we thank Batima store for the coaxial and the Clipperton Dx Club who lend ACOM1010 to François. The online log is on QRZ.COM (FT3YL) and on Clublog. QSL ok via LoTW and via F6KPQ bureau or direct with 2 green stamps. MARCH 6 — FT3YL, Dumont D’Urville. QRN (S9+) François has moved station. Less comfort (5°C in new shack). Be patient, he will be back soon on the air. 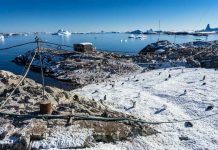 FEBRUARY 18 — François FT3YL is now active from Dumont d’Urville French Antartic Base in Terre Adélie on 10-15 and 20 meters. He is using a GPA30 antenna located on the roof of his office. Not easy to have big antenna, wind was about 160 km/h last night. He is active for the moment only in JT65 and had made around 50 QSO with JA, VK, ZL, BY, UA0 and USA. He has been heard also in UA3. He will try to be active also in PSK31 and SSB later. He is mostly active between 09h00 UTC and 11h00 UTC after his working day. Online log is on clublog and QRZ.COM. Don’t send your QSL now, OQRS will be available in few weeks. Please, don’t request sked with him, he is Dumont d’Urville during 1 year. LoTW request to ARRL will be done soon. DECEMBER 11, 2016 – François F4HLT/FT3YL leaves Australia on 11th December on board the Astrolabe (French TAAF ship) and will go to the French Antartic base of Dumont D’Urville. On Dumont D’Urville, his call-sign will be FT3YL. He won’t be QRV before February. He will be active in SSB and digital modes on 10-15 and 20 meters. Equipment: IC706 + ACOM 1010 (Tnx Clipperton Dx Club) + GPA30 (Tnx F5BU). He will provide updates here. QSL via F6KPQ, OQRS Club Log and LoTW. Note: François is a newbie, he is not used to pileups. So please, be patient. SEPTEMBER 13, 2016 — François, F4HLT will be active as FT3YL from Dumont d’Urville, Adelie Land in a few months time. The license is valid from December 2016 to February 2018. Activity will not occur immediately but likely few months after arrival. Adelie Land counts for IOTA AN-017. I’m a beginner in HF radio but I want to try to install a ham radio station at Dumont d’Urville a French scientific base. My job is my priority, I can transmit only during my spare time. I’m not a DXpedition. This activity will be secondary to the scientific work. During this mission of 1 year in Antarctica, my QSL manager is F6KPQ.